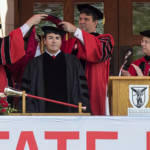 Ball State dedicated the John H. Schnatter Institute for Entrepreneurship and Free Enterprise in 2016. It is funded by money from Schnatter and the Charles Koch Foundation. A portion of an email statement from Rick Hall, sent to the Ball State community. Schnatter has been in the news recently after he was heard saying an offensive slang term for African-Americans. In a statement Friday, Ball State Board of Trustees president Rick Hall says Schnatter used that word “not in a derogatory manner,” but in a private meeting with consultants as an example of what not to say. Hall says with Ball State, Schnatter has “never expressed racist views.” He says the school will continue to support the business program, which funds several faculty and student positions. Public document requests from the Muncie Star Press show Ball State received less than a dozen complaints after Schnatter’s situation became public. The face of Papa John’s pizza is a 1983 Ball State graduate. His graduate school alma mater, the University of Louisville, removed Schnatter’s name from its football stadium and similarly-funded business program. Schnatter himself resigned from a position on the school’s Board of Trustees. Also on Friday, Purdue University’s Board of Trustees voted unanimously to strip Schnatter’s name from its economic center. Purdue Board Chairman Michael Berghoff – reading from a statement at the meeting – says the economics center will revert to its original name, the Purdue University Research Center in Economics. Purdue trustees say the school will offer to return the $8 million Schnatter donated in April.